GAINESVILLE, Fla. (AP) — A large, flightless bird that fatally attacked a Florida man is among about 100 exotic animals from his estate now up for auction. The Gainesville Sun reports the Gulf Coast..
“The most dangerous bird in the world” killed its owner after the man fell on his own property. 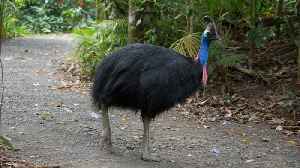 A 75-year-old US man has been killed by his pet cassowary - a giant creature which is considered the world's most dangerous bird. After years of speculation, researchers from La Trobe University believe they know what the hard growth on the cassowary's head is used for. 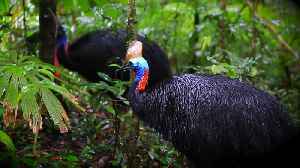 The exotic prehistoric-looking southern cassowary is being wiped out by threats not only to its habitat but also from local wildlife. A Chinese dinosaur has been discovered with a distinct crest on its skull similar to that of the modern Queensland cassowary's casque, a study has found. Footage of a cassowary taking a daily bath in far north Queensland has captured the moment when a floating stick gave the endangered bird the shock of its life. A video posted to Facebook two days ago shows the chicks with their dad, "Yellow Knees". ​Wildlife officers have relocated a young cassowary, known by locals as Ruthie, after it threatened an older man and tried to enter his Innisfail home. Man suffers cuts and bruises but no serious injuries. A CASSOWARY expert says a man who was attacked by an aggressive adult male was very lucky to escape without being seriously injured. Buster the cassowary shows up for beach wedding.